WOW Bradford is back for its third year being held mainly at Kala Sangam Intercultural Arts Centre, St Peter’s House, 1 Forster Square, Bradford BD1 4TY (next to Bradford Cathedral). 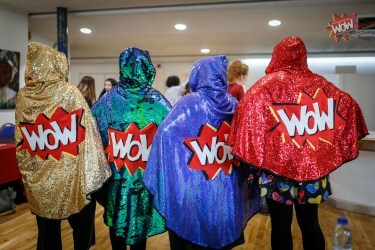 WOW is a global festival that celebrates the incredible achievements of women and girls, takes a frank look at the obstacles they face, and creates a space to discuss new solutions together. With over 2 million people involved, WOW takes place in 30 cities including across the UK, in New York, Baltimore, Pakistan, Nepal, Bangladesh, Australia, Somaliland, Finland, and in Bradford. There will be a weekend of talks, discussions, music, activism, performance, mentoring and big ideas, and hear from women who are breaking the mould in science, entrepreneurship, the arts, sport, economics, health and business from Bradford, nationally and internationally. There are sessions on everything from personal lives through to global concerns, including race, body image, violence against women and girls, religion, the role of men in gender equality, and a special one off set from Kate Tempest. Find details and the latest programme at the Kala Sangam website or WOW Bradford Facebook page. This entry was posted in Events, Get Involved / Have Your Say, Nov and tagged WOW Bradford.